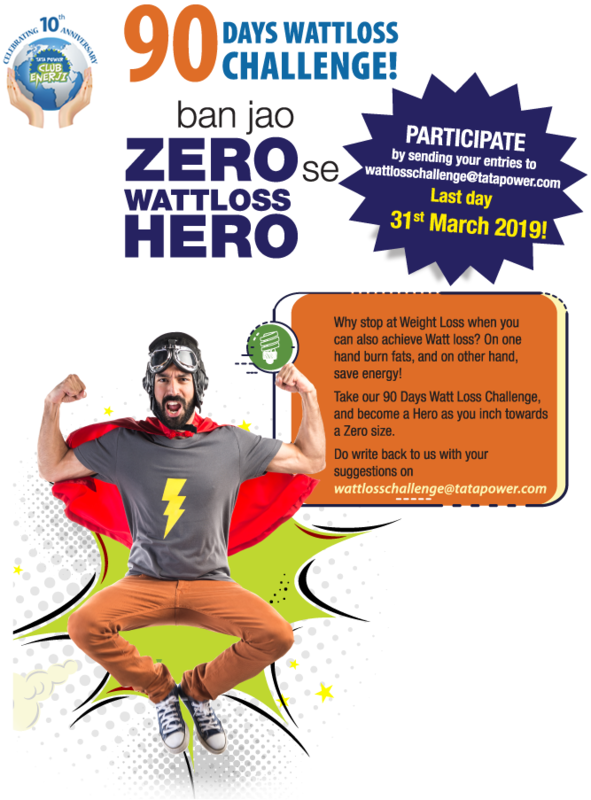 The Wattloss Challenge is a 3 month contest where people will be rewarded for most energy saved for a period of 3 months. The energy saved will be monitored through electricity bill generated at the end of each month. The energy savings will be monitored from Jan'19 onwards. Keep Air Conditioners at 26 degree or more. Use LED's and BEE 5 star rated appliances. Lower the use of heating and cooling appliances. In summer, keep cool by closing windows, doors, curtains and blinds. Check that the fridge seals, keep the door firmly closed. At homes ,use natural light when possible. Don't leave your mobile phone plugged in overnight. Do not switch on geyser hours before use and switch off immediately after taking a bath. Turn off your home office equipment when not in use. If your computer must be left on, turn off the monitor. Do not keep the chargers for your laptop and mobile phones plugged in as they also draw small amounts of power constantly. Remove the devices from the plug point when not in use. Washing Machines should only be used with full loads.